Posted September 19, 2017 by The Rapid & filed under News. With more than 1,300 entries being displayed throughout Grand Rapids over 19 days, ArtPrize Nine kicks off on Sept. 20 and runs until Oct. 8. This renowned event is the perfect chance to rediscover Grand Rapids while indulging in a variety of art, music, film and other entertainment. Parking spots are a hot commodity during this event. Rather than dealing with the stress and cost of parking, leave your car at home or park it at Meijer and ride The Rapid. If you’re traveling from the outskirts of Grand Rapids, seven area Meijer locations are offering up their parking lots for you to use. You can also park at either of the Silver Line Park ‘n’ Ride lot located at 60th Street and Division and Burton and Division. We’ll help you do the driving and make your ArtPrize experience more enjoyable. While at Meijer, you can also purchase an ArtPrize Metro Pass. For just $5, you’ll receive unlimited rides on the Silver Line and 10 rides on Rapid fixed-route buses. This amazing transit deal also includes an exclusive day pass to the ArtPrize Clubhouse where you can enjoy a free drink, snacks and a place to rest in between venues. 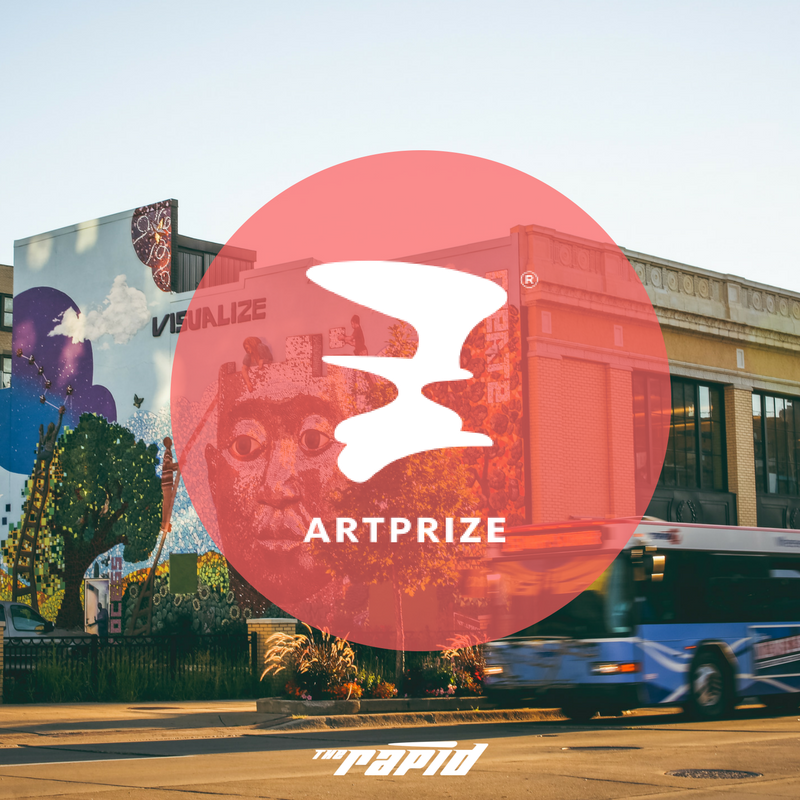 Transit is the smartest way to get around ArtPrize, so why not give all forms a try? Aside from The Rapid’s regular fixed-route buses, there’s also the Silver Line and DASH that can keep you moving. All three of these bus options provide unique benefits and connection opportunities. Whether it means parking and riding the Silver Line from 60th Street or using one of the parking lots on the edge of Downtown, these transit options can get you to the center of the ArtPrize action. One major bonus is that both Silver Line and DASH are free to passengers riding within the Downtown area. This year, DASH West will even be running on extended hours seven days a week to ensure that you can see all that ArtPrize has to offer with the ease and convenience of the Downtown shuttle service. ArtPrize is the perfect excuse to get out and try a new form of transportation! Did you know that ArtPrize has its very own app? Aside from being able to cast your vote for your favorite entries, the ArtPrize app also offers visitors continuously updated information on announcements, events, venues and much more. Download the app from the Apple Store of Google Play today to get prepared for the week ahead. If you’re riding The Rapid, DASH or the Silver Line, you can also access real-time bus information via several different third-party bus tracking apps. Our favorite is myStop, which will allow you to plan your transit trips, track your bus in real time and see what stops are nearby. This will make navigating the city and transit even easier for you. These pathways provided by X-Rite Pantone offer clear paths of travel for ArtPrize explorers to navigate their way through this 19-day event. There are six pathways that highlight each neighborhood’s character including local businesses, distinct neighborhoods as we as features venues and activities. Each path is just 2.4 miles or less so you can experience nearly all venues from pathway access. Take in all that Beer City USA has to offer by using ArtPrize’s Brew Lovers’ Experience Guide. You’ll start your journey at Founders Brewing Co. (across the street from Rapid Central Station) and journey through Grand Rapids as you explore beer offerings. There’s also the option of some coffee exploration on the guide. Check it out. There’s a lot more to ArtPrize than just art installations. ArtPrize Nine attendees will have access to ArtPrize on Screen, which is a film festival featuring six feature-length documentary films, each accompanied by a Michigan-made short. This year, you can also enjoy music at the second annual HopCat WYCE Blue Bridge Music Festival with music from eight musicians and bands from across the country. ArtPrize offers fun for the whole family. Enjoy a variety of interactive activities to unleash your creative spirit during this event. Stop by ArtPrize Labs Studios to create your own piece of art, visit the STEAM Village to experience the power of art and creativity and so much more. Here’s the full list of family-friendly events taking place throughout the city. With so much to see and do in such a just over two weeks, checking out the artists and venues beforehand is a great way to ensure you don’t miss anything. Take a look around the ArtPrize website to map out all of the locations you don’t want to miss and even discover news places in Grand Rapids! You may even want to plan your walking, biking or transit trip in advance. Our RapidConnect Trip Planner is a handy assistant for this task. Enjoy ArtPrize! See you on board.